“[We] seek equilibrium. In the normal state, we are comfort-centered, externally-directed, self-focused, and [externally] closed. We construct a world of social exchange and economic transaction. The central purpose of anyone in such a system is to obtain status and resources while avoiding pain and punishment. When emerging reality threatens our deeply held values by suggesting we need to move into the unknown, we resist. We become self-deceptive because we say change is needed, yet we want to avoid the risk of losing what we have, so we seek to ‘manage’ change in ways we do not find deeply threatening” (p. 69). “In the normal state, we typically employ two general strategies of change: Telling, that is, making logical arguments for change and Forcing, that is, using forms of leverage such as threat or firing or ostracizing. Less often, we use a third strategy, Participating, that is, using open dialogue and pursuing win-win strategies” (p. 69). “When we are in the [Fundamental State of Leadership,] we become more purpose-centered, internally-driven, other-focused, and externally-open” (p. 21). “We become less comfort-centered and more purpose-centered. We stop asking, What do I want?…Instead we ask, What result do I want to create?…[That] may attract us outside our comfort zone and into the uncertain journey that is the creative state. 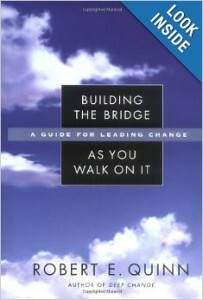 As we begin to pursue purpose in the face of uncertainty, we gain hope and energy” (p. 22). “[We] also become less externally-directed and more internally-directed….We begin to transcend our own hypocrisy, closing the gap between who we think we are and who we think we should be” (p. 22). “[We] also become less self-focused and more other-focused. As our sense of achievement and integrity increases, we feel more secure, less selfish, and more willing to put the common good ahead of the preservation of self” (p. 22). “[We] become less internally-closed and more externally-open. When we meet our needs for increased achievement, integrity, and affiliation, we increase our confidence that we can learn our way forward in an uncertain and changing world” (p. 23). Maybe you are starting your first full-time post-college job. Or maybe you are starting over in a new place. If so, this post may be for you. It’s your first week on the job. Let’s recognize the obvious. First, every job has a “honeymoon” period. As in life, the weather changes. When the storm comes, you will question whether you’re are where you should be. Second, some conflict comes naturally. Disagreements and feelings of frustration are not unusual. The remedy is to understand the source of the conflict. Is it shallow or deep? Is it about personality or culture? Third, you weren’t hired to be a change agent. And even if you were, be patient. According to Heifetz et al (in The Practice of Adaptive Leadership), people aren’t afraid of change, per se. They are afraid of losing something. Therefore, when they sense change is approaching, they become emotionally attached to what is, not what might be. A bird in the hand is worth two in the bush. Best to listen and learn and leverage the good already occurring and be changed yourself. The first thing to do in terms of self-change is to take a back seat, listen, and learn. The more you know at the beginning, the better you will be prepared to deal with what comes later. What you will want to know in the beginning is the culture of the organization, and the leadership styles of those in power over you. What you want to develop is greater emotional intelligence and an understanding of what it means to be a leader. Then you can develop a short-term and long-term plan for making a difference. Soon you will be second-guessing your decision to choose the company and job you did. Why? One reason is the culture of the organization. It may not be what you expected or are accustomed to. So it is good to understand it. To understand the culture of your organization, begin by mapping it. Consider Cameron and Quinn’s “Competing Values Framework” (in Diagnosing and Changing Organizational Culture and http://www.artsjournal.com/fieldnotes/2012/12/the-competing-values-framework/). Organizations serve different purposes. They vary in terms of their values. “Adhocracy” cultures value disruptive innovatation and utilize “open systems.” They are organizations without permanent structures. They seek “breakthroughs” — that is, disruptive innovations.In them people jump from project group to project group to understand and solve problems. “Hierarchical” cultures are diametrically opposed to “Adhocracy” cultures. They value “incremental” change” and seek to “control” or reduce chaos within their organizational boundaries. Instead of utilizing open systems, they utilize internal processes to standardize and drive efficiency. IDEO and Google may be great examples of an “adhocracy” or “create” cultures. See “The Deep Dive”: http://www.youtube.com/watch?v=JkHOxyafGpE and http://www.youtube.com/watch?v=9bJBeCI0e3U. Herman Miller may be a great example of a “clan” or “collaborate” culture. See: http://www.youtube.com/watch?v=XkqLZAEL_TQ. A financial services firm may be a great example of a “market” or “compete” culture, as individual brokers compete with competitors both outside and inside the organization. See this clip from the Oliver Stone’s Wall Street: http://www.youtube.com/watch?v=FCctqbRrsBQ. A hospital may be an example of a control culture, because variation from process can result in a patient’s life or death. Thus, if you are a person who likes to innovate and implement fast, you will be frustrated in collaborate or control cultures. If you are a person who likes to work closely with people in a slower-paced predictable environment, you will be frustrated in create or compete cultures. A “clan-oriented” supervisor may need to play a “facilitator” and “mentor” role. Joe Torre, former baseball player and manager, is well-known for caring for people. See: http://www.youtube.com/watch?v=R3FLEHNaWrE. A “adhocracy-oriented” supervisor may need to play an “innovator” or “broker” role. Billy Beane innovated the way we evaluate baseball players and built an organization to support it. See: http://www.youtube.com/watch?v=AiAHlZVgXjk. Steve Jobs practiced “creative destruction.” See: http://www.youtube.com/watch?v=3tDHH1eXKmA. A “market-oriented” supervisor may need to play a “producer” or “director” role. A fictional and negative example is Miranda Priestly, the high priestess of fashion magazines. See: http://www.youtube.com/watch?v=zicgut4gpwU. A “hierarchy-oriented” supervisor may need to play a “coordinator” or “monitor” role. For example, precision and reliability are important in hospitals. See: http://www.youtube.com/watch?v=q6Qgrb8lP4k. Likewise, Goleman (in “Leadership That Gets Results” and http://www.comindwork.com/weekly/2015-07-13/productivity/the-six-leadership-styles-goleman) has a useful model for understanding leadership styles. Goleman’s styles reflect Parker’s findings. Thus it is important for you to know your personal leadership style and the styles of others in your sub-unit. People change faster than culture does, therefore the culture of sub-units change faster than the culture of the entire organization. Better to be in sub-culture and work for a person whose leadership style fits you best. Also, better to know yourself emotionally in case you don’t. If, for example, you crave vision and strategy you will be frustrated in a affiliative, clan culture. One of the least valued yet most important skills is managing your own emotions and positively influencing the emotions of those around you. But first you must see and understand them. Doing so will prepare you to alleviate a lot of frustration later. Understanding your own and the emotions of others is the art and science of emotional intelligence. Becoming more aware of what frustrates you and what gives you energy and why (self-awareness) and what frustrates others and gives them energy (social awareness) and why. It means coming to grips with your competing values map and the competing values maps of others. Becoming more emotionally intelligent means managing your emotions (self-management) so that you can see and take things in perspective. So that you can step up to the balcony to gain a better understanding of what is going on all around you. It seems the followers don’t get the point and it frustrates the boss. The boss is surprised when others negatively respond to their comments/jokes and he/she thinks they’re overreacting. The boss believes it doesn’t matter if he/she is liked at work. The boss weighs in early with assertions and strongly defends them. The boss finds others to blame. For more, see Muriel Maignan Wilkins’ “Signs That You Lack Emotional Intelligence” (https://hbr.org/2014/12/signs-that-you-lack-emotional-intelligence). The point is that you don’t want to be an emotionally-toxic person. The other is that you need to be able deal with someone who is. One helpful framework for understanding your cultural situation and emotional intelligence is to understand the difference between a leader or manager. A manager focuses on systems and structure, a leader focuses on people; a manager maintains, a leader develops; a manager relies on control, a leader inspires trust (Warren Bennis, On Becoming a Leader: http://www.appleseeds.org/Manager-Leader_Bennis.htm). “Leaders don’t care very much for organizational structure or the official blessing of whatever factory they work for. They use passion and ideas to lead people as opposed to using threats and bureaucracy to manage them” (Seth Godin, Tribes, p. 22). “Managers manage by using the authority the factory gives them. You listen to your manager or you lose your job” (Seth Godin, Tribes, p. 22). Managers administrate, leaders innovate; a manager has a short­-range view, a leader has a long-­range perspective; a manager asks how and when, a leader asks what and why (Warren Bennis, On Becoming a Leader: http://www.appleseeds.org/Manager-Leader_Bennis.htm). Thus, leaders are curious persons who explore first and then consider whether or not he/she wants to accept the ramifications (Seth Godin, Tribes, p. 63). Managers are people who consider whether the fact is acceptable to his religion before he/she explores it (Seth Godin, Tribes, p. 63). Leaders ask for forgiveness (Seth Godin, Tribes, p. 70). Managers ask for permission (Seth Godin, Tribes, p. 70). Managers have their eyes on the bottom line, leaders have their eyes on the horizon (Warren Bennis, On Becoming a Leader: http://www.appleseeds.org/Manager-Leader_Bennis.htm). Leaders have faith (Seth Godin, Tribes, p. 80). Managers have religion (Seth Godin, Tribes, p. 80). A manager imitates, a leader originates (Warren Bennis, On Becoming a Leader: http://www.appleseeds.org/Manager-Leader_Bennis.htm). Leaders respond (Seth Godin, Tribes, p. 86). Managers react (Seth Godin, Tribes, p. 86). Leaders do things (Seth Godin, Tribes, p. 87). Managers have things happen to them (Seth Godin, Tribes, p. 87). A manager is a copy, a leader is an original (Warren Bennis, On Becoming a Leader: http://www.appleseeds.org/Manager-Leader_Bennis.htm). You will find more leaders in Collaborative (Clan) and Create (Adhocracy) cultures. If you and your boss make decisions by imitating what your competitors do, both you and your organization are on a path to slow death. Know the culture of your organization and sub-unit. Know your own leadership style and the leadership styles of those around you. Understand the basis of your frustration. Begin to build relationships by learning from and loving your new neighbors. Be the type of person you wish others to be. Seek to do the right thing more than doing things right. Be creative and collaborative across bureaucratic silos; build a tribe. Grow into a “Level 5 Leader,” a person of “personal humility and professional will” (Jim Collins, Good to Great). Empower others to discern, develop, and deploy their gifts and calling. When you are in your first full-time job post-college or starting over, it can initially feel as thrilling as walking on water. But the storm and waves will come. And soon you will sink. You may find yourself drowning. Just remember that whatever happens God is in control. Ground yourself in him and don’t worry. Easier said than done.